An article at LifeSiteNews this week reports on an interview of Cardinal Joseph Zen published by the French website La Croix International, wherein Cardinal Zen “renewed his resistance against the 22 September 2018 ‘provisional’ agreement between the Vatican and Communist China on the appointment of bishops, whose full content, however, is still largely unknown.” The Cardinal protests that because the secret pact admits “to full ecclesial communion the remaining ‘official’ Bishops, ordained without Pontifical Mandate,” the tyrants in Beijing are now proceeding to the long-planned extermination of the Underground Church, given the Vatican’s recognition of the pseudo-Church, the so-called Catholic Patriotic Association (CPA), that Beijing invented to replace the true Church in China. Francis has already lifted the excommunication of seven bishops who were ordained under Communist coercion without a papal mandate and has even handed one of these puppet bishops the diocese of Bishop Guo in Chengde, the true Catholic bishop of that territory. And “[t]he Pope is going to wait before legitimizing the other six. It’s only a matter of time,” said Zen. Zen’s conclusion is perfectly obvious: “[I]ndirectly, the Vatican is helping the government to annihilate the underground Church that Beijing was not able to crush.” Note well: the Vatican is helping Beijing to do what it could not have done before: destroy the true Catholic Church in China. Chen, notes CNA, is “a blind lawyer… imprisoned for his pro-life advocacy against forced abortions and sterilizations under China’s former ‘one child policy’” — which is now a “two-child policy.” Chen escaped a Chinese prison in 2012, gained political asylum in the United States and is now a visiting fellow at Catholic University of America. 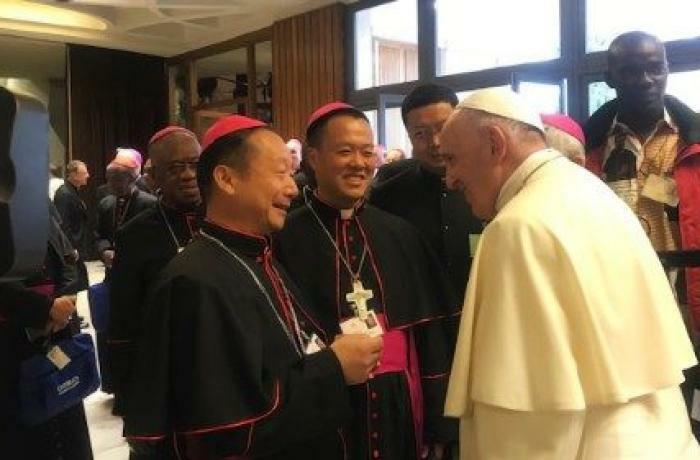 During the recently concluded sham Synod on Youth and Blah, Blah, Blah, Francis warmly greeted two CPA puppet bishops (the moment is pictured above), whom Beijing permitted to attend part of the rigged proceedings. No bishops of the persecuted Underground Church were in attendance. Beijing would never allow it. Perhaps only Judas himself has outdone the Vatican in betraying Christ.